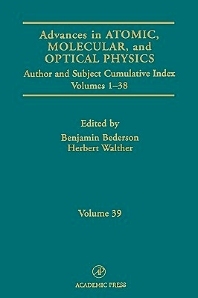 Subject and Author Cumulative Index, Volumes 138. This volume contains the index for volumes 1-38 in the Advances in Atomic, Molecular, and Optical Physics series. Graduate students and researchers in atomic physics, atmospheric science, and chemical physics, as well as cross section users in applied fields.